Meet Samantha! 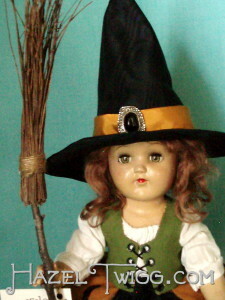 The Bewitching Witch of Autumn. You can see her adoption page HERE. I like pointy shoes almost as much as I like pointy hats! Samantha has BOTH. As many of you might know, this Wednesday I’ll be traveling to Norfolk, Nebraska to be a keynote speaker at a librarian’s workshop. I’ll be taking Samantha with me, along with Dot and Betty as well as the next O.L.D. (Once-Loved Doll) if I can get enough of an outfit done for her in time. 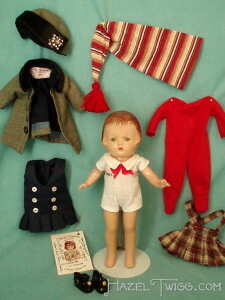 They’ll be good luck charms for me, as well as illustrating just what a composition doll is. Our wee witch Samantha has a custom broom made from a twig I found on one of my walks for the handle and fronds from my black walnut trees for the bristles. Well, it just so happens Samantha is deathly afraid of heights. No matter! We’ll be driving! Me and The Mayor and I think the First Dude will be making a merry travel train to parts unknown (of course, we’ll Google it on the map so we know before we start our journey). I loved the nifty, pillowy thing on this witch’s hips, so I made a similar one for Samantha, complete with cats and (gulp!) bats. When I was growing up, the scariest sight to see in church was the bishop making his way towards you with purpose. “We would like you to give a two-and-a-half minute talk next Sunday,” he would say. Frequently, I wouldn’t be able to answer back. I would just sit there staring up at him, throat dry, instant blurbs of nausea in the pit of my stomach, responding instead with the most miniscule of nods. The following Sunday I would quake as I talked. Never had such a short amount of time seemed so very, very long. Well, the talk this Wednesday is no two and a half minutes! This is FORTY-FIVE. That’s two and a half times, um, MATH. Something! 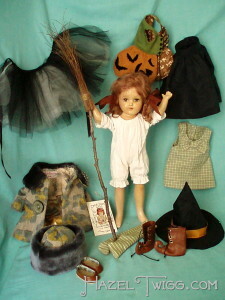 Samantha also comes with “street clothes,” because as much as I would like for it to be, it’s not Halloween year round! 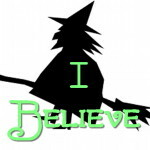 Sensing my trepidation, Samantha called out to me in her tinny tiny voice, “Be not afraid! Watch THIS!” At which point, she hopped onto her freshly made broom and despite her fear of heights, bravely leapt off the counter in my sewing room. I felt kind of bad. 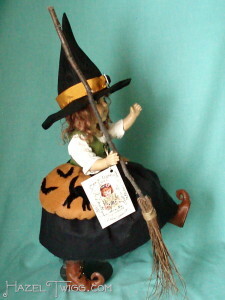 For safety reasons, I hadn’t put a charm onto the broom to make it fly. Luckily, there just so happened to be a pile of fabric on the floor (ahem!) and she landed safely without a scratch. I’m actually looking forward to Wednesday! This is the sort of thing we hoped for from the very first post on this blog and the way it came about hints that maybe it is meant to be. 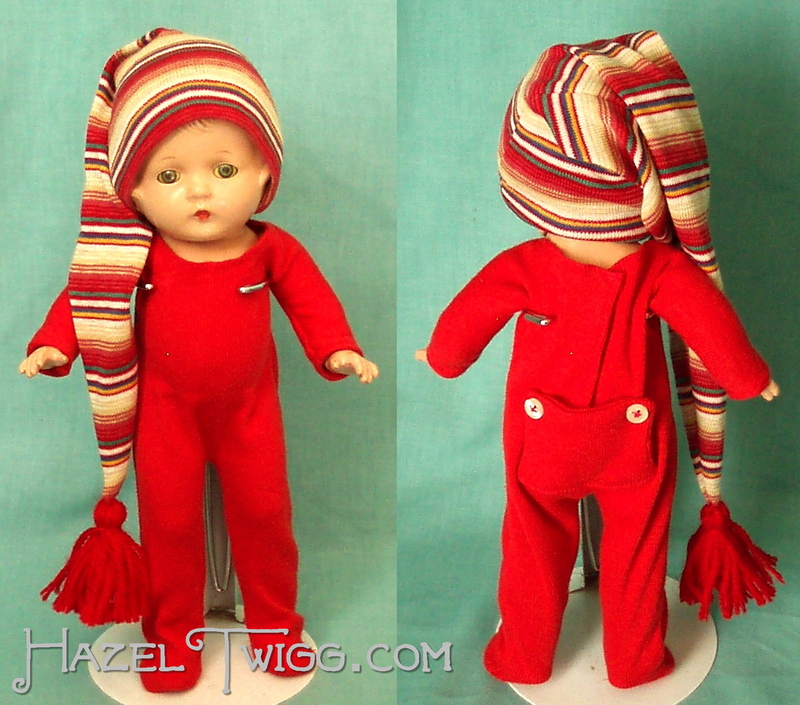 Hazel Twigg and all she entails has been my heart and soul for the past three years, even though she didn’t make an appearance until months into our journey. These composition dolls have been a part of my life for the past twenty-five years, ever since I discovered that such creatures exist. And magic! Magic has been a part of me forever. 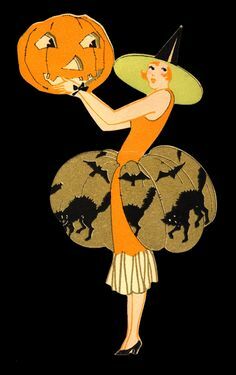 The important thing to remember is that it’s not whether you soar towards the ceiling fan or fall into a soon-to-be-folded and put away pile of fabric, it’s whether you or not you get onto that broomstick in the first place. Our sweet Babs was adopted by the equally sweet Janey J. of Oakland, California! She is now the proud human of two O.L.D.’s! An excellent woman, that Janey. And with that, I leave you! Happy Monday, you’re my favorite. You can see Babs adoption page HERE. “All right, girls! I’ve called this meeting to make an important announcement.” They all collectively groaned. I think they knew what was coming. This certainly wouldn’t be the first time. Little Babs finally gets her marching orders. I opened my mouth to speak again. “I thought it was two months ago!” Jean cried out – without raising her hand, mind you. These are my favorite pajamas to date. Nice and cozy. Just in time, too! It’s in the 40s here in Iowa as I write! I was greeted with silence. For a bit. “No!” A small voice cried out from the back of the crowd. I looked but didn’t see anything. I did, however, hear a fiercely hushed conversation coming from the same direction as that no. And then I did see an arm raised. “Yes? What is it?” I called out. Little Babs comes with a LOT. 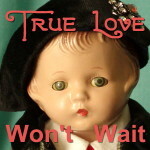 Usually the O.L.D.s (Once-Loved Dolls) accept what I say with a little groaning, yes, but without question. To have such a bold move come from one so small was a novel situation. Rather than speaking from her position at the back of the crowd, she made her way up front and motioned for me to lean down. She was only about a foot tall, from what I could tell. There was no way I could get down that far and maintain my dignity! I picked her up and lifted her to my ear instead. And listened. When she finished, there was no way I could let another week go by without putting her up for adoption. Other things would have to wait. With so many girls to choose from, and new ones showing up on my doorstep, it’s hard to remember them all, but little Babs reminded me: She was supposed to be O.L.D. number 4. Number 4. But I have to go where my inspiration moves me, not from callousness, but from necessity, and she was set aside. 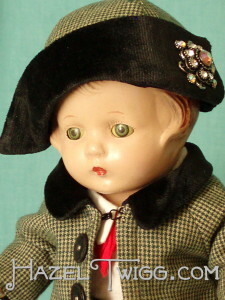 I always say you have to listen to that still, small voice, and in this case the small voice came from a very earnest Babs, who felt that now the timing was exactly right, and that while she may be no one special – a Horsman doll made to compete with the very popular Patsy – her new little human was waiting in the wings for her. Not a year ago, not next week, NOW. I have no idea how I was able to say no to that earnest little face the first time around. It wouldn’t happen again! And so, without further ado, I present O.L.D. No. 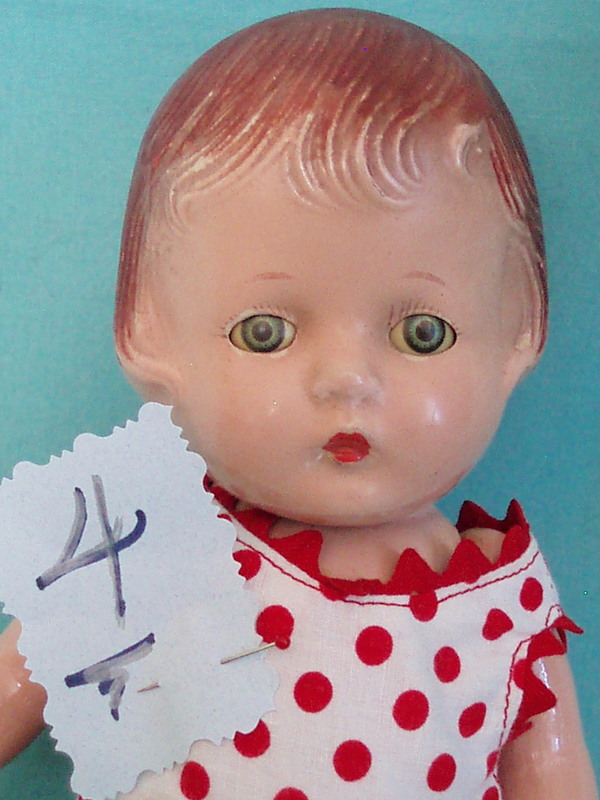 53, Babs, the little girl with the very earnest request. The next O.L.D. won’t be this Sunday, she’ll be up for adoption this WEDNESDAY at 6:33 instead. That book’s not going to write itself. I left a pen by the computer and everything. No dice. With each pass it gets better, and we’re still going to publish this fall. 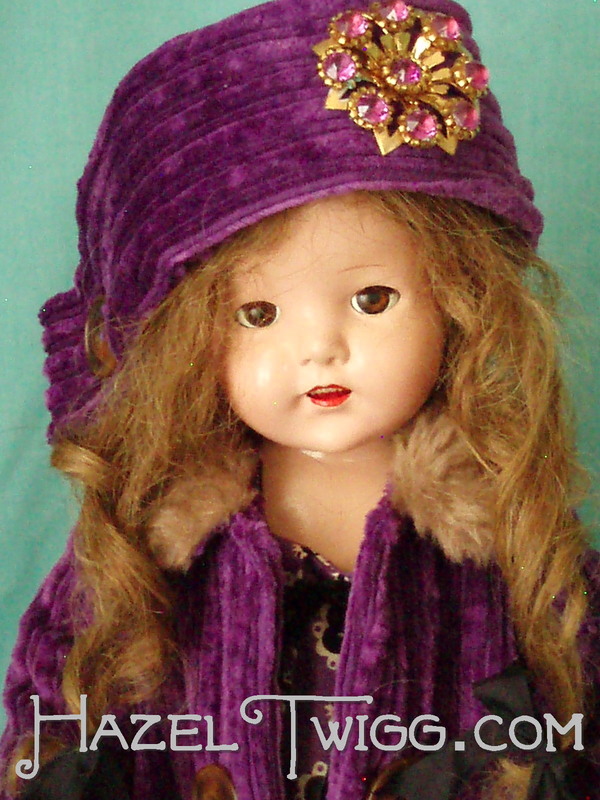 Pretty in purple Penelope was adopted by the lovely Linda L. of Portola Valley, California. Thank you so much, Linda! And with that, I leave you! Have a great weekend, you’re my favorite! *My brothers tell me that this kind of post makes me sound a little insane. It would – IF – it hadn’t actually happened. HAH! PENELOPE in her purple corduroy. Have you ever encountered something that you didn’t like at all, only to later become obsessed with it? That happened to me with cantaloupe. It also happened with this wide-wale vintage purple corduroy. I have no idea where I got it, but when I reorganized my fabrics, I stuck it away all by it’s lonesome in a glass-fronted cabinet. It was the Rudolph of my fabrics on the island of misfit toys! I would occasionally glance at it as I passed by…It actually was quite a pretty shade…Really, not so ugly as I thought…OOH! I MUST use this! But then doll after doll would appear on my doorstep, and none of them would have it! I’d actually given up using it altogether. Enter Penelope. I hadn’t even bothered to offer. I was learning more about her when I saw her looking over my shoulder. I could tell she was no longer listening to a word I said. SQUEE!! I saw what she was looking at! HOORAY! Thus begins the adoption page for our own Penelope, a 21″ Petite composition doll. You can see her adoption page HERE. A lot of things come to mind when I think about purple, and lately I’ve been thinking about it a LOT. First of course is my childhood crush, Donny Osmond. 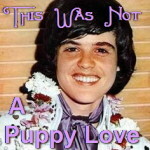 All the Osmond brothers wore different colors, and his was purple. His was the first concert I went to, and when he visited our side of the island, I was less than 10 feet from him at the Polynesian Cultural Center! I’m sure he could feel the magic emanating from my eyes. He still didn’t ask me to marry him. Yes, I’m as shocked as you are. MORE. Another purple thing for me is Penelope Pitstop from the cartoon series, “Wacky Races.” Turns out there were only 17 episodes made, but it somehow stuck with me all this time. *Not actually Julie’s bedroom, but you get the idea. My own wee sister Julie went through a purple phase. 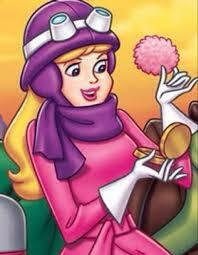 Her bedroom at the time was painted purple and there were purple touches throughout. 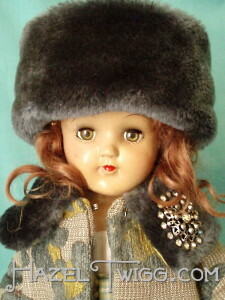 She also had a border of pretty vintage hats that rang ’round the room. Julie has such a good eye. Once we went shopping and she found two rugs on sale that she wanted for the sides of her bed. “That’s not the same shade of purple!” I protested. Against my better judgement, she got them anyway. HMPF! To my surprise, the contrast of different shades was STUNNING. I learned a valuable less that day: things don’t always need to matchy-matchy. I use that lesson often. Purple is not everybody’s cup of tea, and it’s not an easy color to pull off. But when I saw our Penelope’s warm brown eyes, I knew she could do it. So I gave her purple. Purple everything. I released my pent up purple beast! 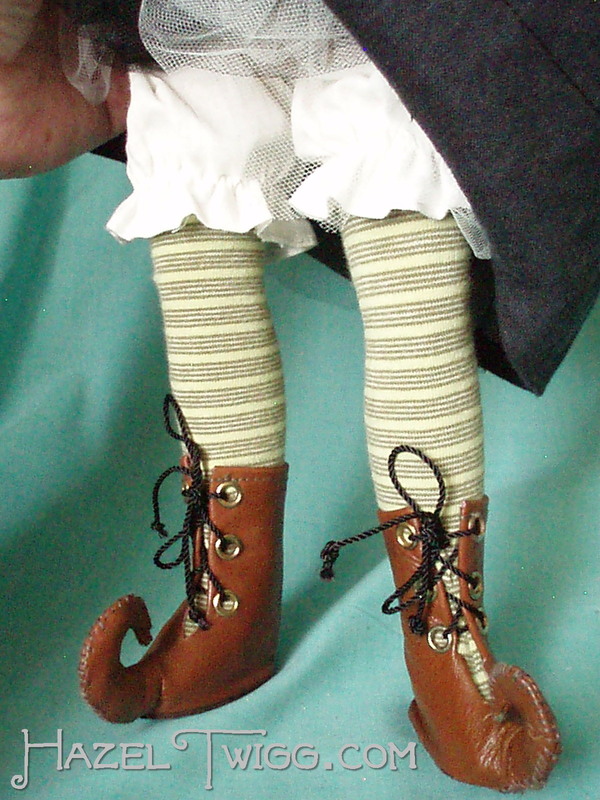 I even added some purple silk ribbon to her bloomers. Her nightgown with the pale lavender hem was made from a pretty hand sewn and embroidered pillowcase. I had so much fun working with her and looking for Things With Purple to use for her. Chloe was adopted by…Michelle E. of Kentucky! Just kidding. Colorado. Thank you, Michelle! And with that, I leave you! 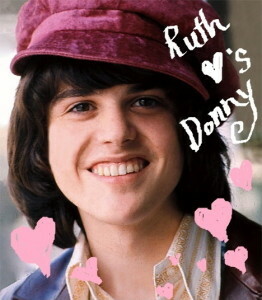 Peace, Love and Donny Osmond, you’re my favorite! This sweet girl is Chloe. She is O.L.D. (Once-Loved Doll) No. 51, and you can see her adoption page HERE. Just in time too, because she ends Wednesday at 6:33! I remember as a child how my classmates and I would quietly snicker at one of our teachers whenever she reached out and snapped her fingers. Because the fleshy part beneath her arm would jiggle! !Snap*jiggle! !Snap*jiggle! Ah, the gales of laughter! Subtly, of course, with our eyes in clandestine glances. Sometimes we would recreate the waggly arm action out on the playground during recess, shouting, “So-and-so! Stop what you’re doing right this INSTANT!” !Snap*jiggle! !Snap*jiggle! ‘Cept we of course would have to manually jiggle the non-existent excess flesh. And since we were away from the teacher, we could freely laugh aloud. Oh, how the mighty have fallen. I often think of that long ago teacher, whose name I’ve forgotten, when I put on short sleeve tees. Good thing I’m not a very good finger snapper, is all I can say. If you looking closely in the pictures, you can see I took her photos before her arms were ready. BEFORE. It doesn’t look too bad in the photo, but she has lifting on her inner elbows and the palms of her hands. DURING: When I removed the lifted skin, there was a lot of space to fill. AFTER: She now feels comfortable wearing short sleeved dresses and is trying to learn how to snap her fingers. 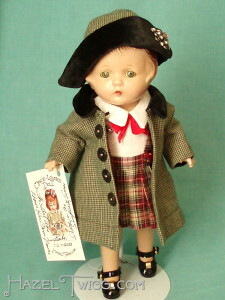 Chloe is 4th in the Simplicity Series, which is my term for dolls that come with less elaborate but still charming era-appropriate clothes, rather than the off the beaten path outfits I frequently enjoy doing. 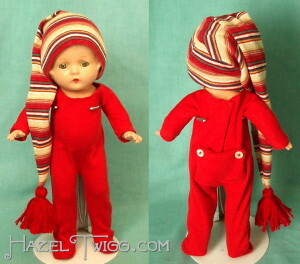 The idea was that they would also be easier for me to sew, because I wouldn’t have to figure out how to make a horse or an umbrella, for example. “For a Simplicity doll, she sure isn’t simple! Too many clothes!” my sister The Mayor cackled recently. For a wee thing, she sure does yap a lot (actually, she keeps me in check and keeps me sane-ish). A girl’s gotta do what a girl’s gotta do. That said, Halloween is just around the corner….I can’t WAIT. Sweet Leilani was adopted by…sweet Janey J. of Oakland, California! The same girl who out of the blue sent me a box of treasures, because she thought there were things in there I might be able to use. Most notably (so far!) she provided the plume for Marjorie the Majorette. Thank you, Janey! I know you and Leilani will get along just fine. Use caution when hula dancing. I speak from experience. Ahem. And with that, I leave you! Happy Snapping, you’re my favorite!